The word biceps comes from the Latin words bi (meaning “two”) and caput (meaning “head”; the same root as the word for capital). The biceps muscle is formed by separate tendons, or heads, which converge to form one muscle. The two heads are known as: the long head and short head. 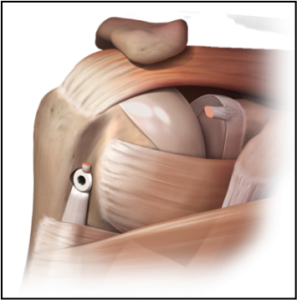 The long head originates just above the socket of the shoulder joint, which is a ball and socket joint. 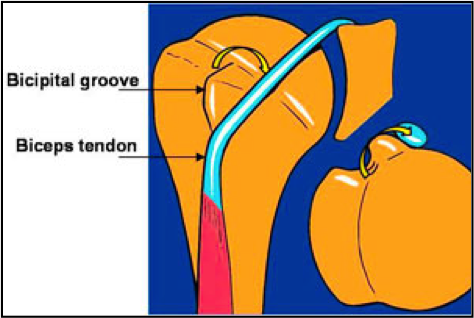 This tendon then passes through the joint of the shoulder and takes a nearly 90° turn into a groove in the upper arm bone, known as the bicipital groove. Due to this sharp angle turn, the long head of the biceps tendon has a tendency to slide out of the groove. The tendon is stabilized in the groove by both bony and soft tissue restraints. The depth of the bony bicipital groove helps stabilize the tendon. Furthermore, the overlying soft tissue structures, including the transverse humeral ligament and the subscapularis tendon (one of the rotator cuff tendons), also help to stabilize the biceps tendon in the bicipital groove. rotational injury) or from overuse in the setting of degenerative soft tissue changes, may result in instability of the biceps tendon. Biceps instability describes the clinical situation in which the biceps tendon slides in and out of the bicipital groove. When the biceps tendon comes partially out of the bicipital groove that is known as biceps subluxation. A biceps dislocation is the term used to describe the scenario in which the biceps tendon comes entirely out of the groove. Biceps instability, either in the form of a subluxation or a dislocation, typically results in pain in the front of the shoulder that radiates down the front of the arm towards the elbow along the course of the biceps muscle. This pain is often worse with certain movements, including shoulder rotation, reaching behind the back, and resisted elbow flexion (ie biceps curls). Furthermore biceps instability often leads to popping or catching sensations in the front of the shoulder. 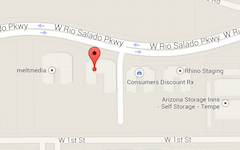 tears and impingement syndrome. The symptoms associated with these conditions can make the diagnosis of biceps instability somewhat difficult. The diagnosis of biceps instability is typically made by a combination of the patient’s history and the findings on physical examination. X-rays are frequently obtained to rule out other sources of shoulder pain, but are usually normal in the setting of isolated biceps instability. 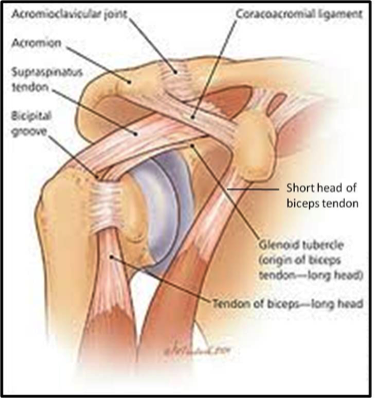 An ultrasound study or an MRI scan may show abnormalities of the biceps tendon and possibly other associated shoulder pathologies. The treatment of biceps instability is usually surgical. Surgical treatment options include: 1) Biceps tenotomy: cutting and releasing the long head of the biceps tendon so that it no longer slides in and out of the bicipital groove causing pain and a popping; or 2) Biceps tenodesis: cutting the tendon at its origin, resecting a portion of the tendon, and reattaching the remainder of the tendon to the upper arm bone further down the arm below the bicipital groove so that it no longer slides in and out of the bicipital groove causing pain and popping.